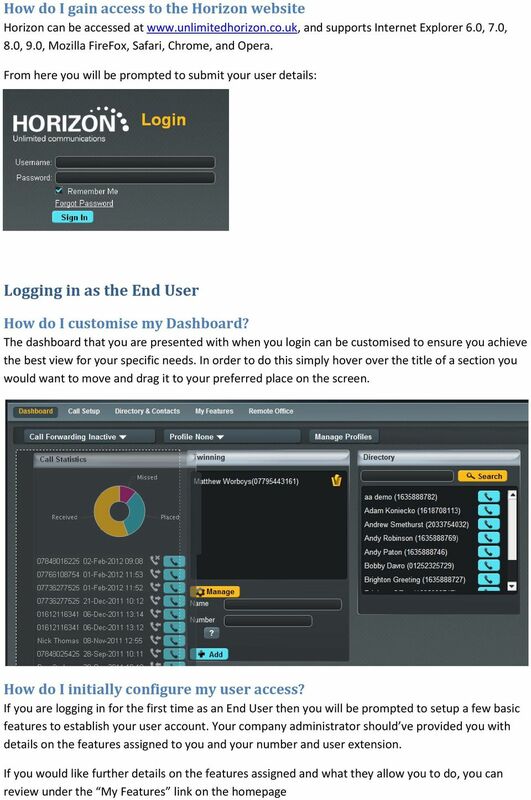 Download "Contents How do I gain access to the Horizon website... 2 Logging in as the End User... 2 How do I customise my Dashboard?... 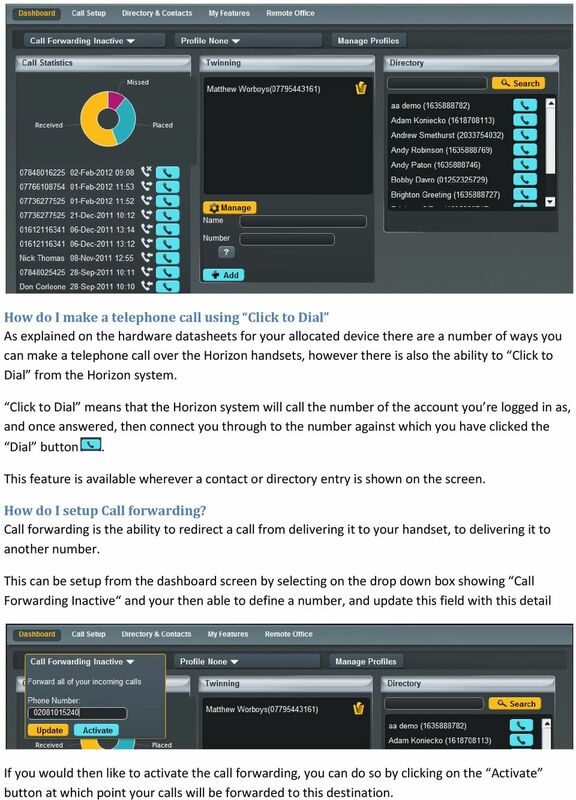 2 How do I initially"
4 How do I make a telephone call using Click to Dial As explained on the hardware datasheets for your allocated device there are a number of ways you can make a telephone call over the Horizon handsets, however there is also the ability to Click to Dial from the Horizon system. Click to Dial means that the Horizon system will call the number of the account you re logged in as, and once answered, then connect you through to the number against which you have clicked the Dial button. This feature is available wherever a contact or directory entry is shown on the screen. How do I setup Call forwarding? Call forwarding is the ability to redirect a call from delivering it to your handset, to delivering it to another number. This can be setup from the dashboard screen by selecting on the drop down box showing Call Forwarding Inactive and your then able to define a number, and update this field with this detail If you would then like to activate the call forwarding, you can do so by clicking on the Activate button at which point your calls will be forwarded to this destination. 5 How do I manage my profile status? A call profile allows the system to know what status you re in and manage your calls according to the rules you have defined for each status. These can be selected through the drop down menu for Profile Through simply clicking on one of these statuses the system will implement the call routing configured straight away. How do I adjust my call profiles? 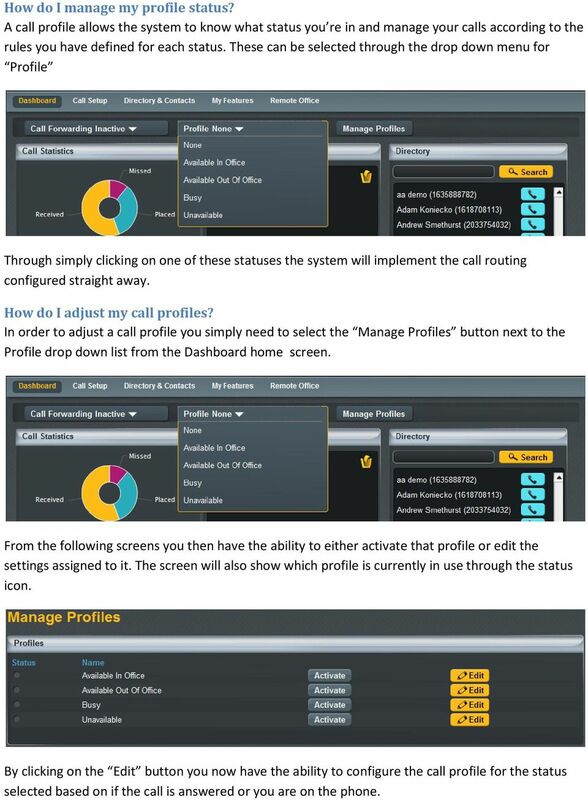 In order to adjust a call profile you simply need to select the Manage Profiles button next to the Profile drop down list from the Dashboard home screen. From the following screens you then have the ability to either activate that profile or edit the settings assigned to it. The screen will also show which profile is currently in use through the status icon. By clicking on the Edit button you now have the ability to configure the call profile for the status selected based on if the call is answered or you are on the phone. 7 Made Received If you then wish to call this contact or number back you re able to through clicking on the Dial icon which will action a return call through the Click to Dial feature. How do I setup twinning of my mobile with my landline? 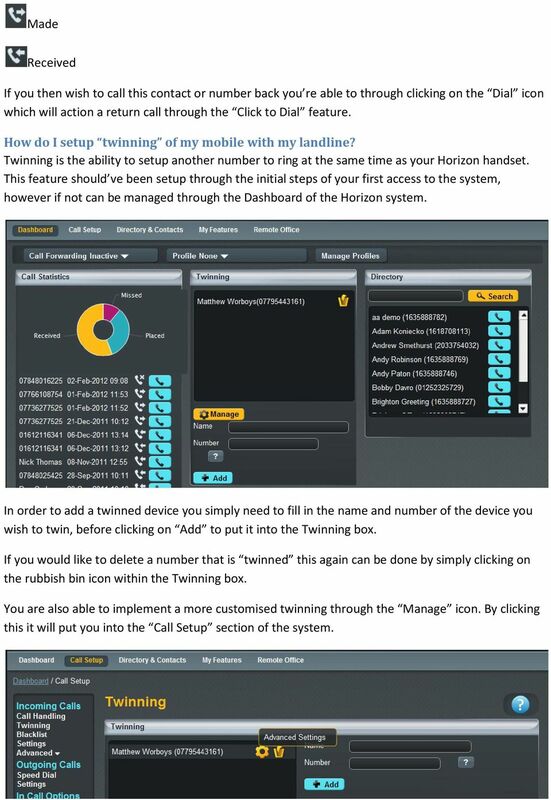 Twinning is the ability to setup another number to ring at the same time as your Horizon handset. This feature should ve been setup through the initial steps of your first access to the system, however if not can be managed through the Dashboard of the Horizon system. In order to add a twinned device you simply need to fill in the name and number of the device you wish to twin, before clicking on Add to put it into the Twinning box. If you would like to delete a number that is twinned this again can be done by simply clicking on the rubbish bin icon within the Twinning box. You are also able to implement a more customised twinning through the Manage icon. 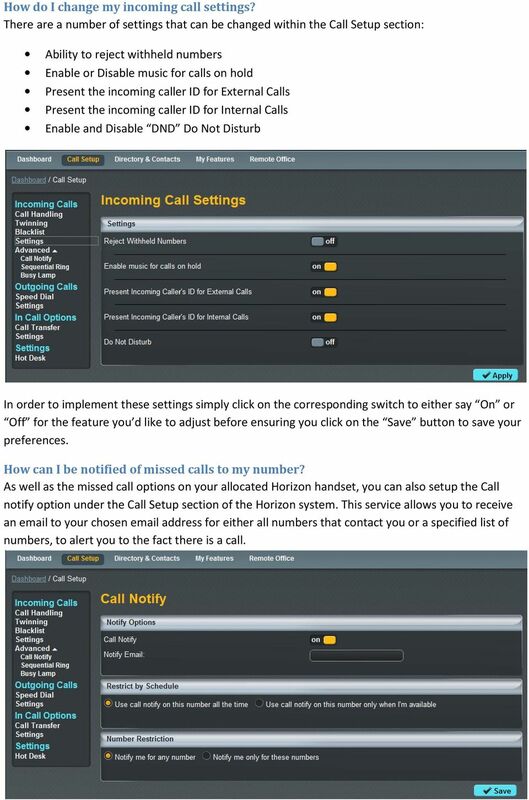 By clicking this it will put you into the Call Setup section of the system. 8 Through here if you then click on the Advanced Settings icon you will have the ability to customise the use of twinning on your number. 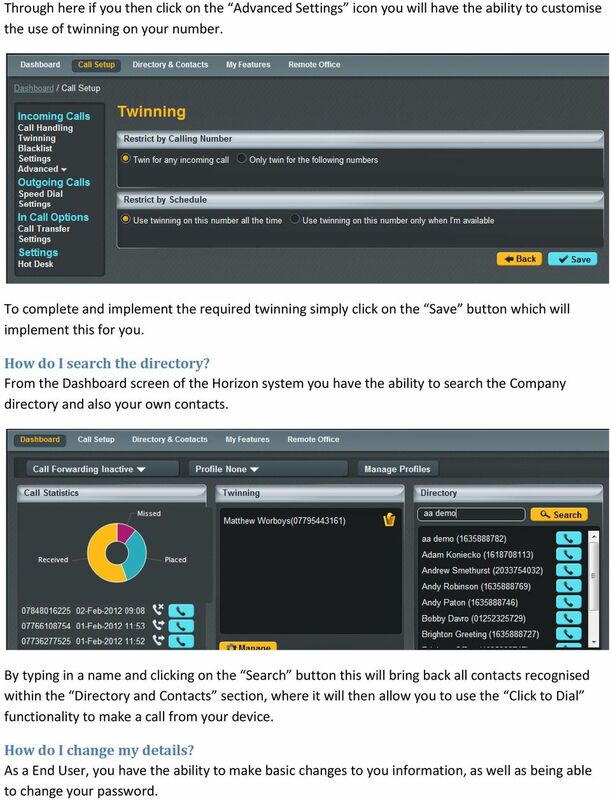 To complete and implement the required twinning simply click on the Save button which will implement this for you. How do I search the directory? From the Dashboard screen of the Horizon system you have the ability to search the Company directory and also your own contacts. By typing in a name and clicking on the Search button this will bring back all contacts recognised within the Directory and Contacts section, where it will then allow you to use the Click to Dial functionality to make a call from your device. How do I change my details? As a End User, you have the ability to make basic changes to you information, as well as being able to change your password. 9 In order to access this you simply need to select My Details from the user menus. 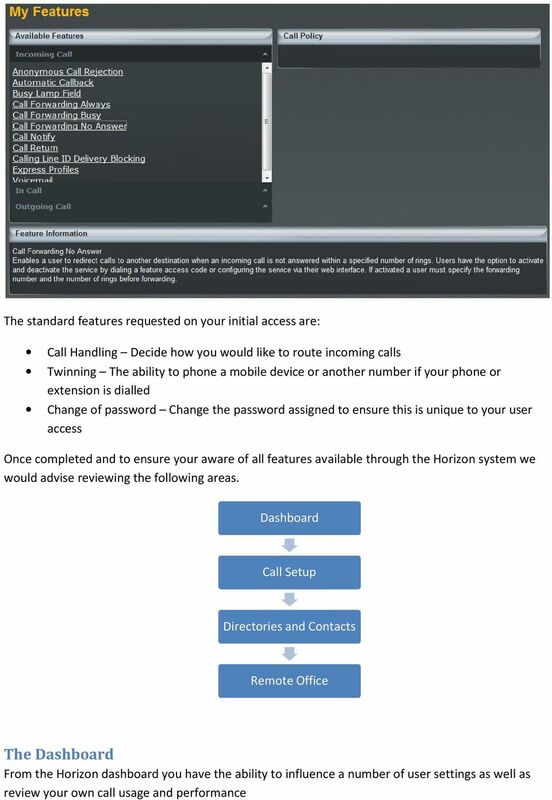 Call Setup Within the Call Setup section of the Horizon system you have the ability to control and implement a number of different services and features How can I handle incoming calls? To handle incoming calls you can use the user profiles to adjust your status and the call routing accordingly, or you can look to use the Call Handling screens to pre-define the settings you would like to apply. 10 In order to adjust these settings simply click the relevant button and update the field, or search using the Address Book button before clicking on Save to implement the changes made. How do I blacklist a caller? If you are constantly receiving marketing calls or other nuisance calls types from specific numbers, you have the ability to Black List a telephone number. To do this simple type in the number to be BlackListed and click on the Add button to add them to the list. Please ensure you also click on the Save button to ensure this list is saved. 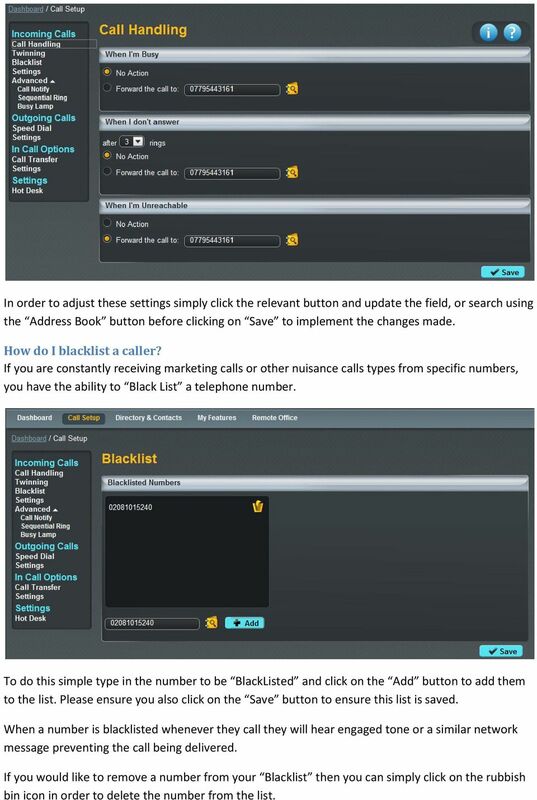 When a number is blacklisted whenever they call they will hear engaged tone or a similar network message preventing the call being delivered. If you would like to remove a number from your Blacklist then you can simply click on the rubbish bin icon in order to delete the number from the list. 11 How do I change my incoming call settings? 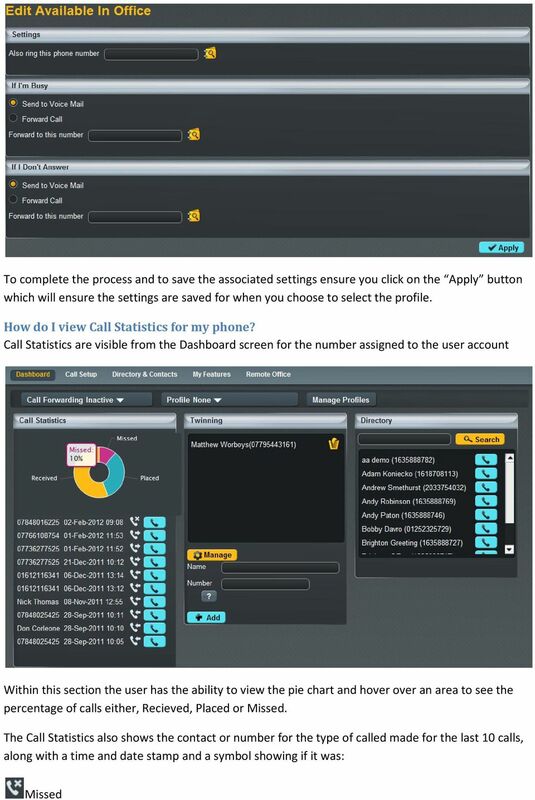 There are a number of settings that can be changed within the Call Setup section: Ability to reject withheld numbers Enable or Disable music for calls on hold Present the incoming caller ID for External Calls Present the incoming caller ID for Internal Calls Enable and Disable DND Do Not Disturb In order to implement these settings simply click on the corresponding switch to either say On or Off for the feature you d like to adjust before ensuring you click on the Save button to save your preferences. How can I be notified of missed calls to my number? 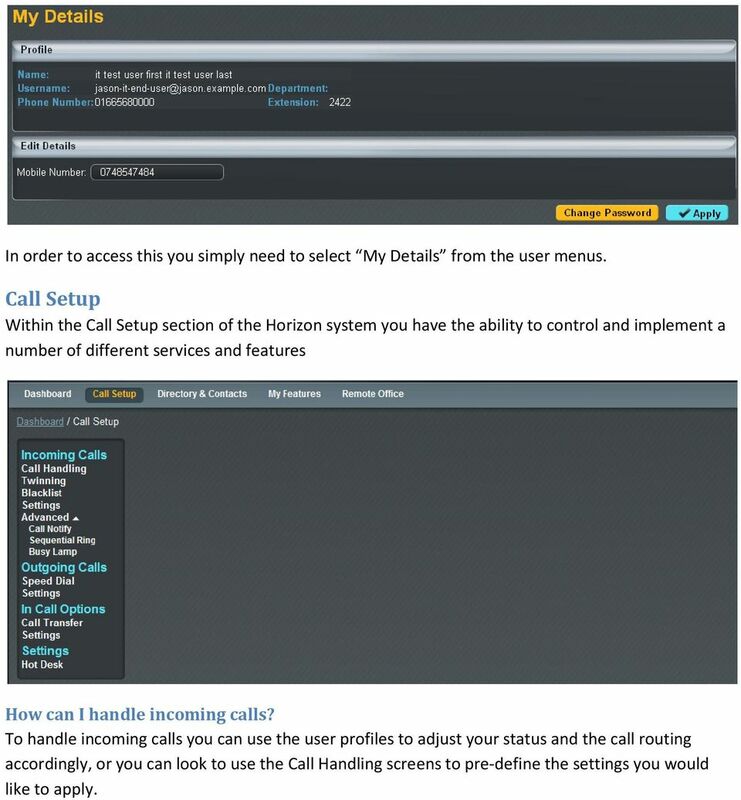 As well as the missed call options on your allocated Horizon handset, you can also setup the Call notify option under the Call Setup section of the Horizon system. This service allows you to receive an to your chosen address for either all numbers that contact you or a specified list of numbers, to alert you to the fact there is a call. 12 In order to implement this option, simply click on the On switch and then define how you wish to be notified of calls, before clicking on the Save button to save your configuration. How do I set my number to find me over multiple devices? This can be achieved through the use of sequential ringing located under Call Setup in the Horizon systems. 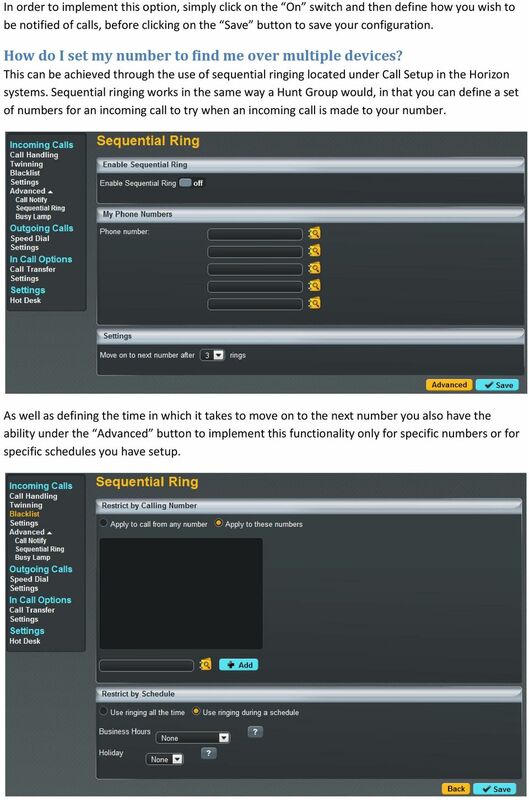 Sequential ringing works in the same way a Hunt Group would, in that you can define a set of numbers for an incoming call to try when an incoming call is made to your number. As well as defining the time in which it takes to move on to the next number you also have the ability under the Advanced button to implement this functionality only for specific numbers or for specific schedules you have setup. 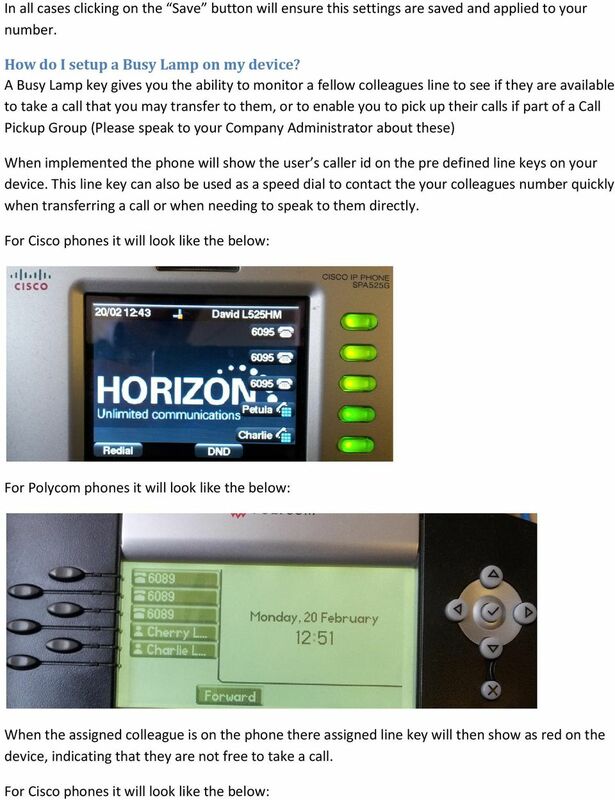 14 For Polycom phones it will look like the below: In order to setup a Busy Line key, this must be done through the Horizon system under the Call Setup advanced section, and at present can only be done by the Company Administrator. How do I setup speed dials? A speed dial is the ability to type a single or combination of numbers to implement the calling of feature or contact. 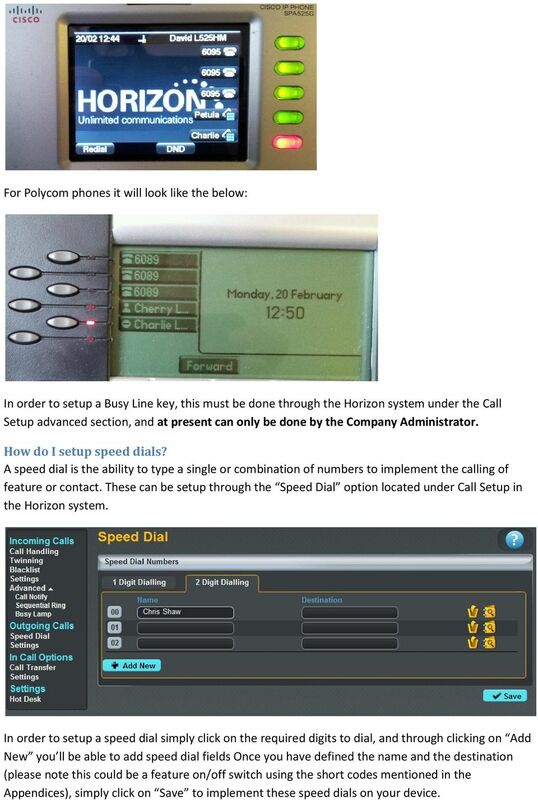 These can be setup through the Speed Dial option located under Call Setup in the Horizon system. In order to setup a speed dial simply click on the required digits to dial, and through clicking on Add New you ll be able to add speed dial fields Once you have defined the name and the destination (please note this could be a feature on/off switch using the short codes mentioned in the Appendices), simply click on Save to implement these speed dials on your device. 15 Please note that you can also setup speed dials from your allocated Horizon handset, however these are not linked to the system. Therefore a locally stored speed dial on your handset will always overwrite a speed dial setup within the system. You should therefore choose which method you would like to implement and manage your speed dials from. How do I change my outgoing call settings? 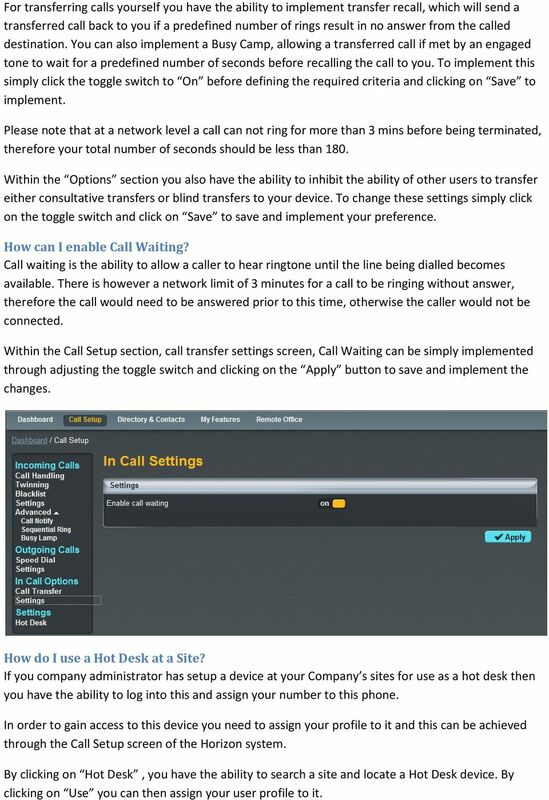 There are a couple of outgoing call settings that you are able to implement through the Call Setup section under the Settings link Enable Automatic Call Back Withhold my number when making calls In order to change these settings simply click on the toggle switch to either On or Off before clicking the Apply button to implement your chosen preference. How can I change my Call Transfer settings? When you have answered a call you have the ability to transfer this through to another colleague or number. 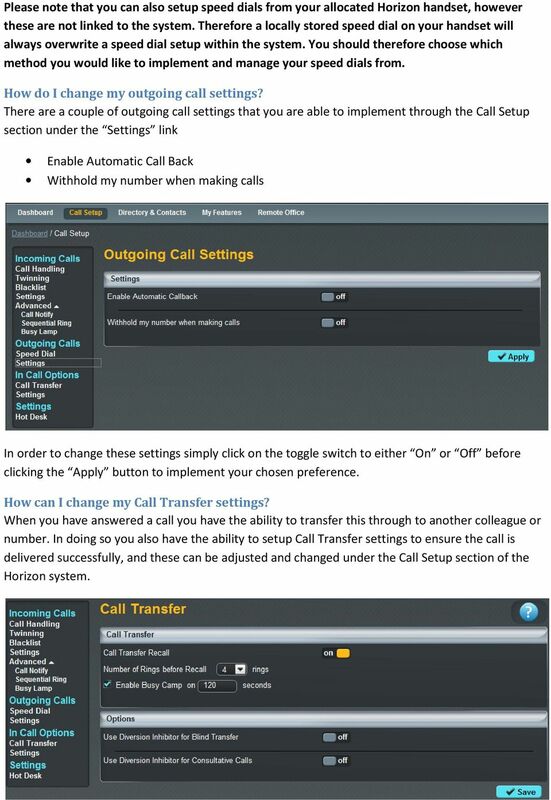 In doing so you also have the ability to setup Call Transfer settings to ensure the call is delivered successfully, and these can be adjusted and changed under the Call Setup section of the Horizon system. 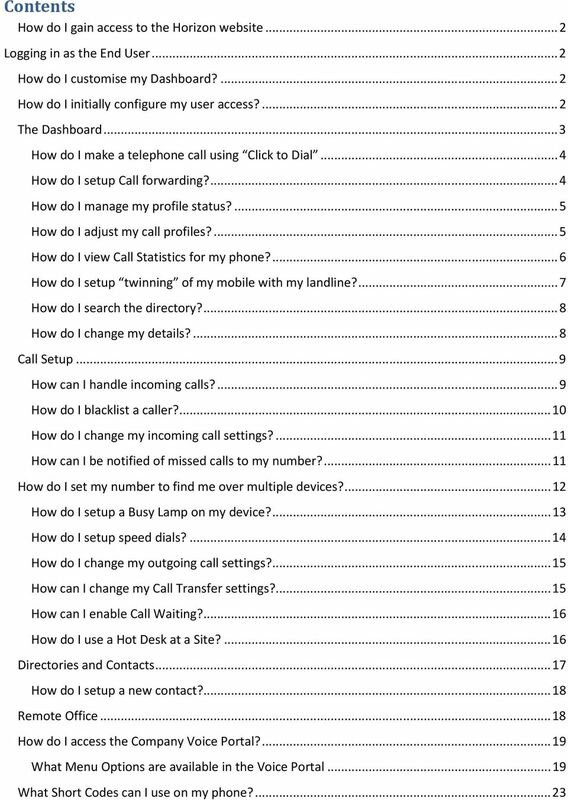 16 For transferring calls yourself you have the ability to implement transfer recall, which will send a transferred call back to you if a predefined number of rings result in no answer from the called destination. 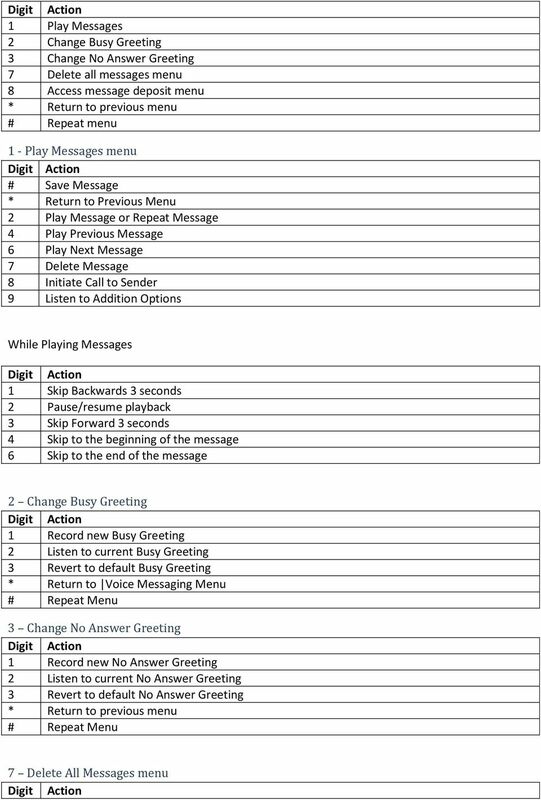 You can also implement a Busy Camp, allowing a transferred call if met by an engaged tone to wait for a predefined number of seconds before recalling the call to you. To implement this simply click the toggle switch to On before defining the required criteria and clicking on Save to implement. Please note that at a network level a call can not ring for more than 3 mins before being terminated, therefore your total number of seconds should be less than 180. Within the Options section you also have the ability to inhibit the ability of other users to transfer either consultative transfers or blind transfers to your device. To change these settings simply click on the toggle switch and click on Save to save and implement your preference. How can I enable Call Waiting? Call waiting is the ability to allow a caller to hear ringtone until the line being dialled becomes available. There is however a network limit of 3 minutes for a call to be ringing without answer, therefore the call would need to be answered prior to this time, otherwise the caller would not be connected. Within the Call Setup section, call transfer settings screen, Call Waiting can be simply implemented through adjusting the toggle switch and clicking on the Apply button to save and implement the changes. How do I use a Hot Desk at a Site? If you company administrator has setup a device at your Company s sites for use as a hot desk then you have the ability to log into this and assign your number to this phone. 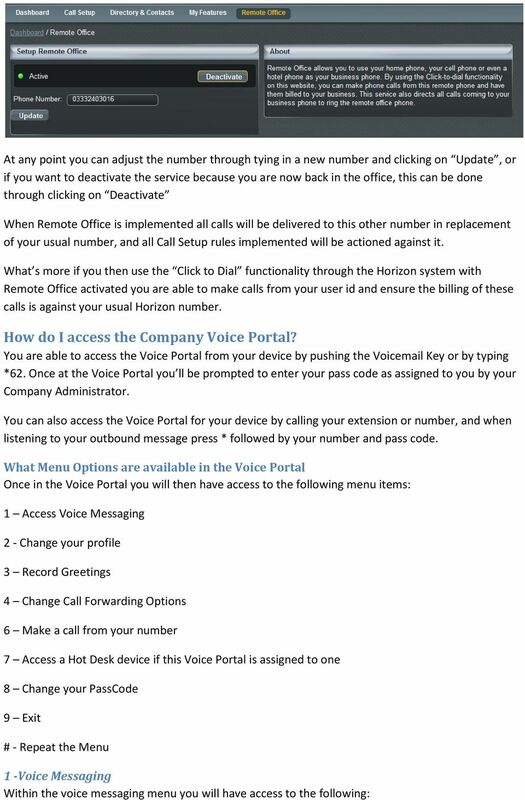 In order to gain access to this device you need to assign your profile to it and this can be achieved through the Call Setup screen of the Horizon system. By clicking on Hot Desk, you have the ability to search a site and locate a Hot Desk device. By clicking on Use you can then assign your user profile to it. 17 Was this button has been clicked the allotted time by your company administrator will then begin and a count down of this can be viewed. 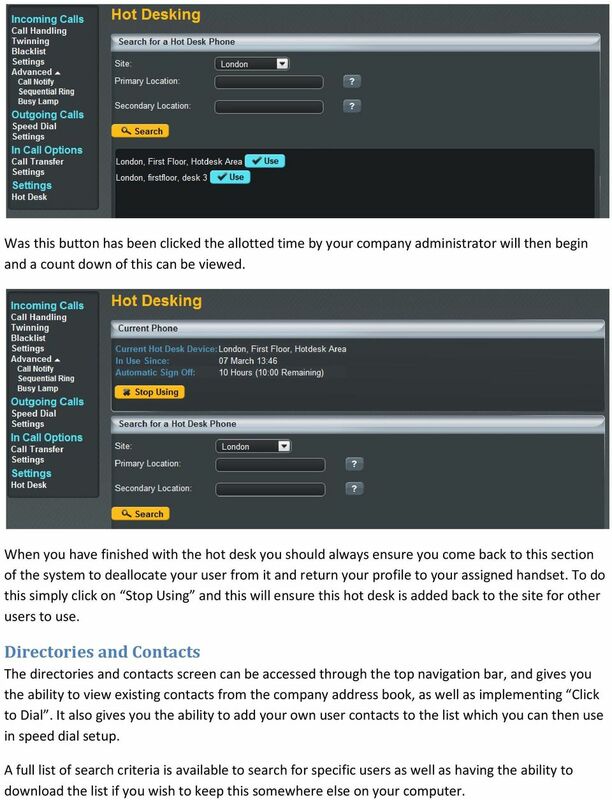 When you have finished with the hot desk you should always ensure you come back to this section of the system to deallocate your user from it and return your profile to your assigned handset. To do this simply click on Stop Using and this will ensure this hot desk is added back to the site for other users to use. Directories and Contacts The directories and contacts screen can be accessed through the top navigation bar, and gives you the ability to view existing contacts from the company address book, as well as implementing Click to Dial. It also gives you the ability to add your own user contacts to the list which you can then use in speed dial setup. A full list of search criteria is available to search for specific users as well as having the ability to download the list if you wish to keep this somewhere else on your computer. 18 How do I setup a new contact? Only the Company Administrator has the ability to add or assign a new contact to the company address book, however a user does have the ability to add their own contacts to the system. To do this simply click into the Directory and Contacts section before then clicking on Add at the bottom of the page. 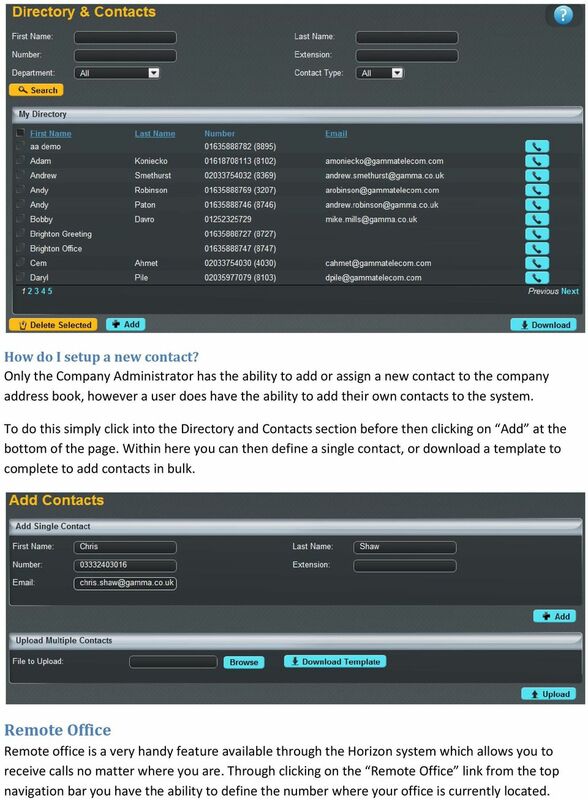 Within here you can then define a single contact, or download a template to complete to add contacts in bulk. Remote Office Remote office is a very handy feature available through the Horizon system which allows you to receive calls no matter where you are. Through clicking on the Remote Office link from the top navigation bar you have the ability to define the number where your office is currently located. User Features. Hosted VoIP Services. Administrator Guide. Revision 1.2 GCI. Global House. 2 Crofton Close. Lincoln LN3 4NT. www.gcicom.